How to handle difficult questions and difficult people. The primary challenge was script development. The Society had completed a research project to understand the most pressing concerns of their target audience of astronomers and scientists. We worked closely with our clients, revising the script to select the topics from their outreach curriculum that were most requested by the audience and that would most benefit from a training video presentation. We selected a humorous approach for engaging our audience and allow them to laugh at their own past mistakes when presenting to the public. We wrote and developed five scripts using techniques from our story development process, including reviewing our client’s needs, writing several drafts of the scripts, rehearsing with professional actors and presenting a staged reading to a live audience. Critiques from the reading were used to revise the script. Although it was not the case in the production of these outreach videos, we have often produced “Beta” videos for the Astronomical Society. These are economically produced, rapidly finished test versions that can be distributed to a focus group of astronomers for comment and revision. The final training videos incorporated “right way” and “wrong way” skits to illustrate key communication concepts. We shot the 5 videos in a single day of production, on location, at the Chabot Space and Science Center. 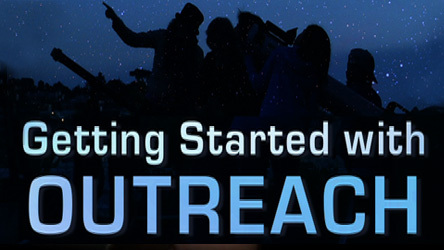 The Sharing the Universe videos have been distributed to more than 400 astronomy clubs throughout the United States. The astronomers who studied our training videos have initiated more than 28,000 public astronomy events, reaching more than 3 million people.